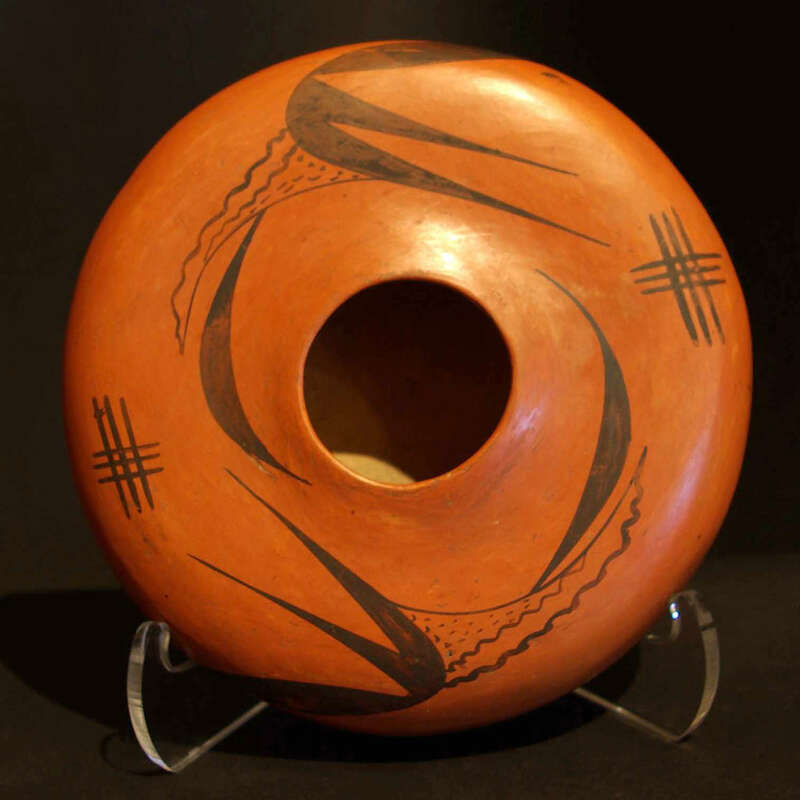 The Hopi have lived in their corner of the Colorado Plateau for more than a thousand years. 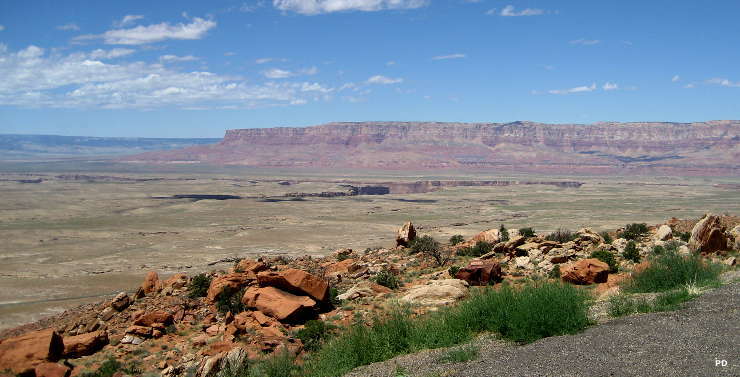 Their reservation is surrounded on all sides by the Navajo Nation, land set aside for a much larger tribe that entered and settled in the area about the same time the Spanish first arrived in force in the New World. The Hopi trace their ancestral routes back through the ancient Sinagua people of Arizona and the Anasazi of the Four Corners area. To honor those ancestors, some of the Hopi travel every year to various of the ancient sites and conduct religious services in remembrance. The center of Hopi territory is located about 80 miles northeast of Flagstaff. 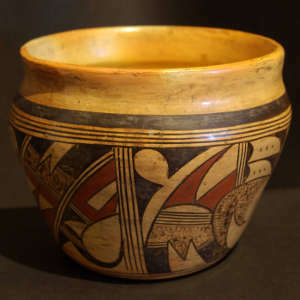 Today there are twelve Hopi villages located in the areas of Hopi First, Second and Third Mesas, mesas which rise up to 1,000 feet above the surrounding desert and afforded some degree of security in the old days. 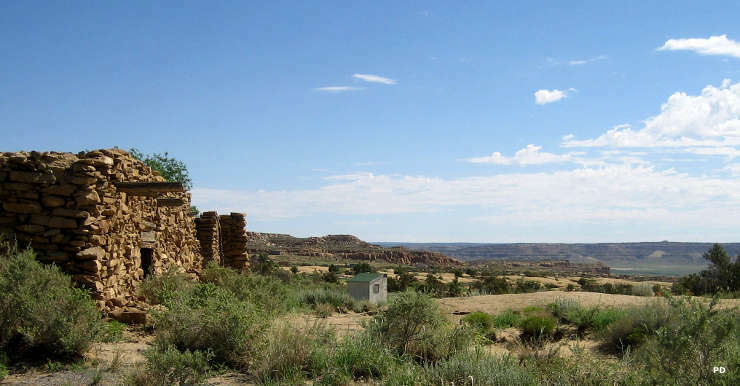 Old Oraibi (on Hopi Third Mesa) and Acoma Sky City both are more than one thousand years old and have somewhat equal claim to being the oldest still-inhabited settlements in the United States. During Coronado's stop at Zuni in 1540 he sent Pedro de Tovar and Frey Juan de Padilla with a group of soldiers to the Hopi area in search of Cibola, the legendary Seven Cities of Gold. They found nothing of interest to their gold-greedy eyes so they left. The next incursion by the Spanish came in 1629 when a group of Franciscan monks arrived in the village of Awatovi and began trying to convert the Hopi to Christianity. 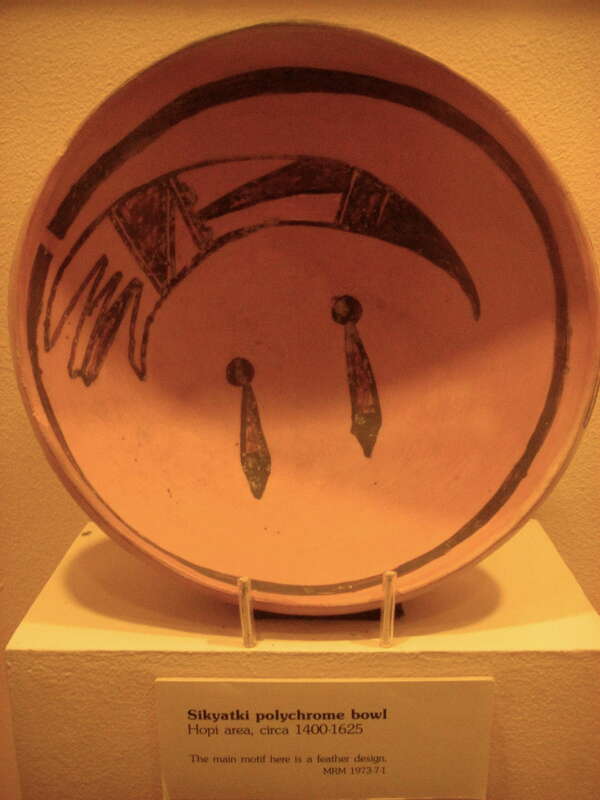 That effort failed and when the Pueblo Revolt of 1680 happened, the Hopi acted together with their Puebloan cousins and destroyed San Bernardo de Awatovi Mission. When the Spanish returned to northern New Mexico in 1692, they quickly retook the Rio Grande Pueblos but it wasn't until 1696 that they tried to retake Hopi territory. That effort failed, although it did lead to the complete destruction of Awatovi and the remains of San Bernardo de Awatovi Mission. The Spanish never did reconquer the Hopi but they did convert a few tribe members to Christianity. Because that conversion also made the convert an enemy of the Hopi people, very few Hopis became Christian in those days. To escape what was happening among the Rio Grande Pueblos in 1700, many Tewa-speaking villagers from that area sought refuge among the Hopi. Hopi leaders made a deal with them in which they were allowed to stay as long as they kept guard over the access path to the top of Hopi First Mesa. Tewa villages were established at Hano and Payupki. Only Hano is still populated and the residents still speak Tewa. The oldest Hopi village on First Mesa is Walpi, established around 900 and expanded in 1690 when the Hopi became fearful of reprisals from the Spanish after the Pueblo Revolt. The villages at the foot of First Mesa were abandoned and the people moved to Walpi atop the mesa. As much as the Hopi rejected all things Christian they did eventually embrace new Spanish agricultural products (apples, apricots, peaches and melons in particular) and new technologies (metal plows and hoes, new wood-working techniques and new textile weaving methods). 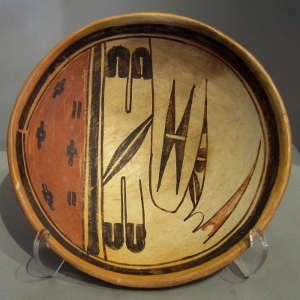 They also embraced horses, cattle, sheep and burros, animals introduced by the Spanish that changed the Hopi way of life. 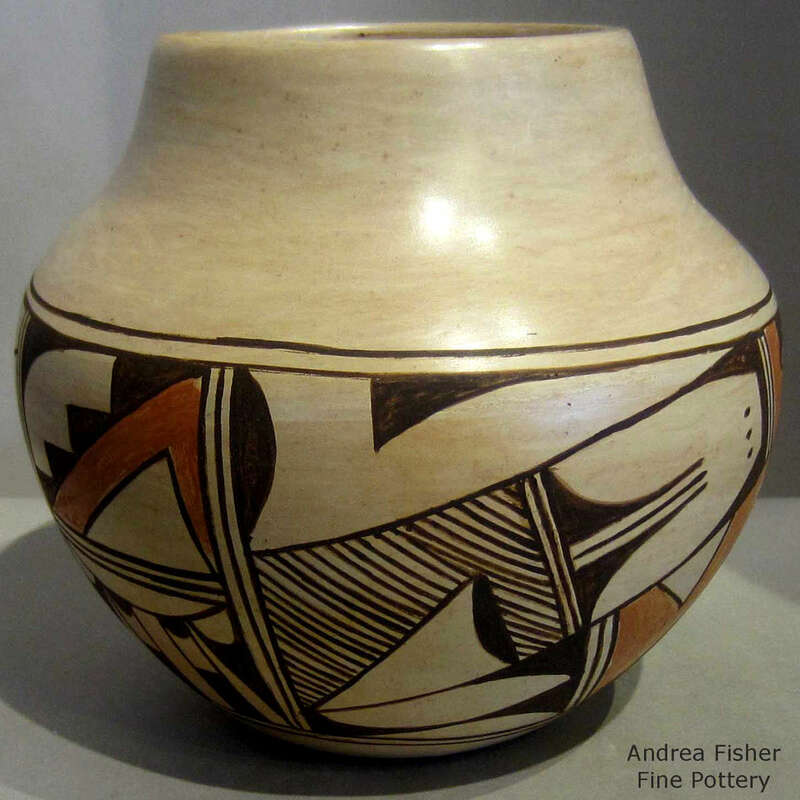 Hopi pottery has a history going back at least 1200 years and many of the designs in use today are direct descendants of those old pots. 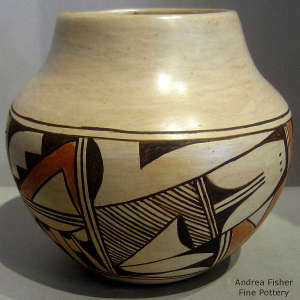 However, the actual making of Hopi pottery has been modified by a number of different elements over the years. After the introduction of sheep, potters began using dry sheep dung to fire their pots. 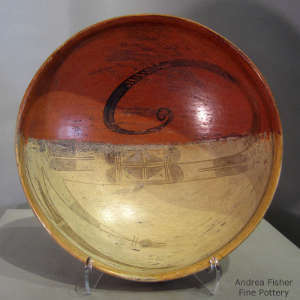 The potters also began to adopt some of the European ceramic designs and shallow, flare-rimmed stew bowls and ring-based bowls began to appear. 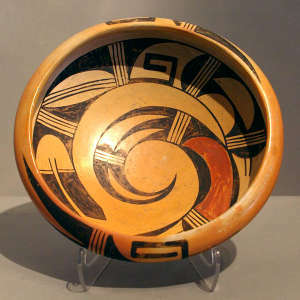 However, like all the other pueblos, the Hopi potters continued to use their hand-coiled molding techniques and did not adopt the "potter's wheel." In the early 1800's drought forced significant numbers of Hopis to move temporarily to Zuni, Zia and Acoma Pueblos. The cross-pollination that happened caused their formerly unslipped tan, orange and light yellow creations to add a white slip and resemble Acoma and Zuni pots of the period. 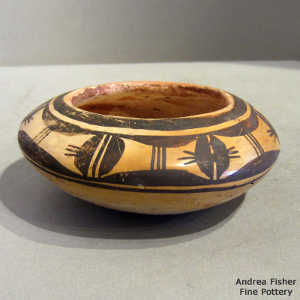 New pottery shapes and designs also emerged during this time, especially large deep bowls and bowls with outward curving rims. 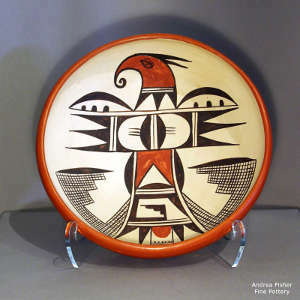 Then for the Hopi, a lot changed when the railroad traders arrived and started ordering large volumes of pottery for their tourists. 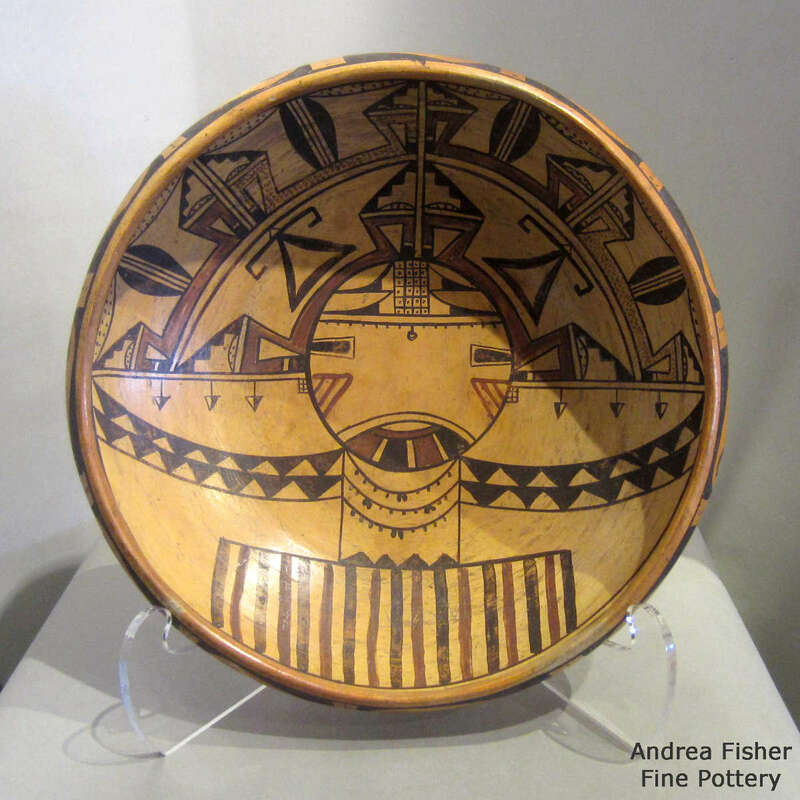 It was almost the death of traditional Hopi pottery. 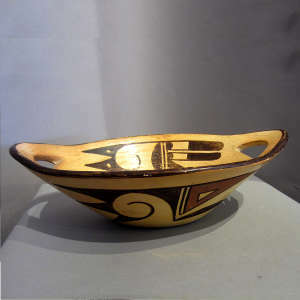 Then the archaeologists arrived and discovered "Jeddito Yellow Ware." 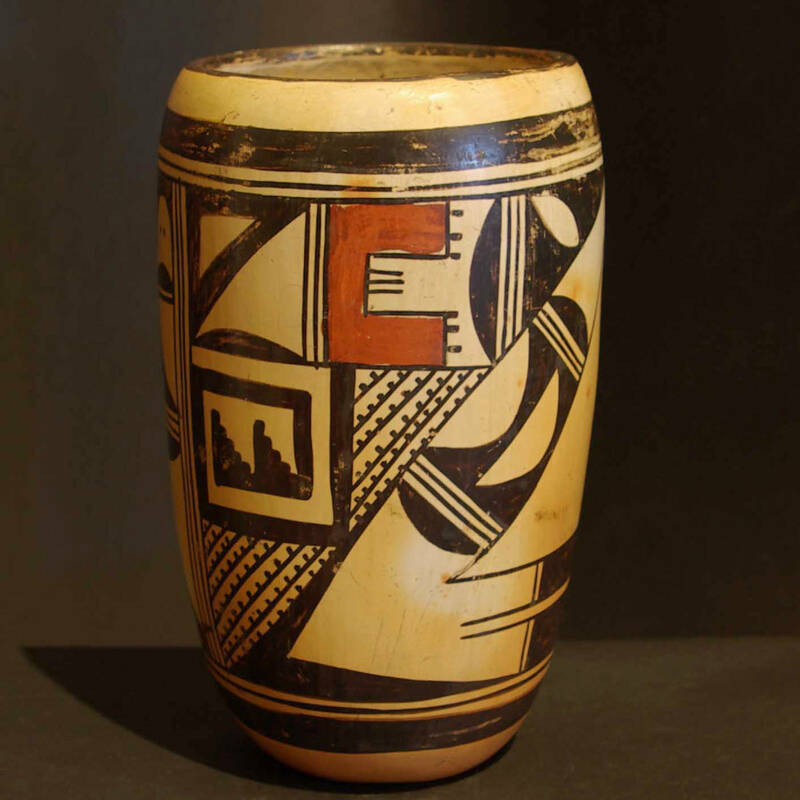 The rediscovery of more ancient Hopi pottery shapes and designs stirred a revival among the Hopi traditionalists. 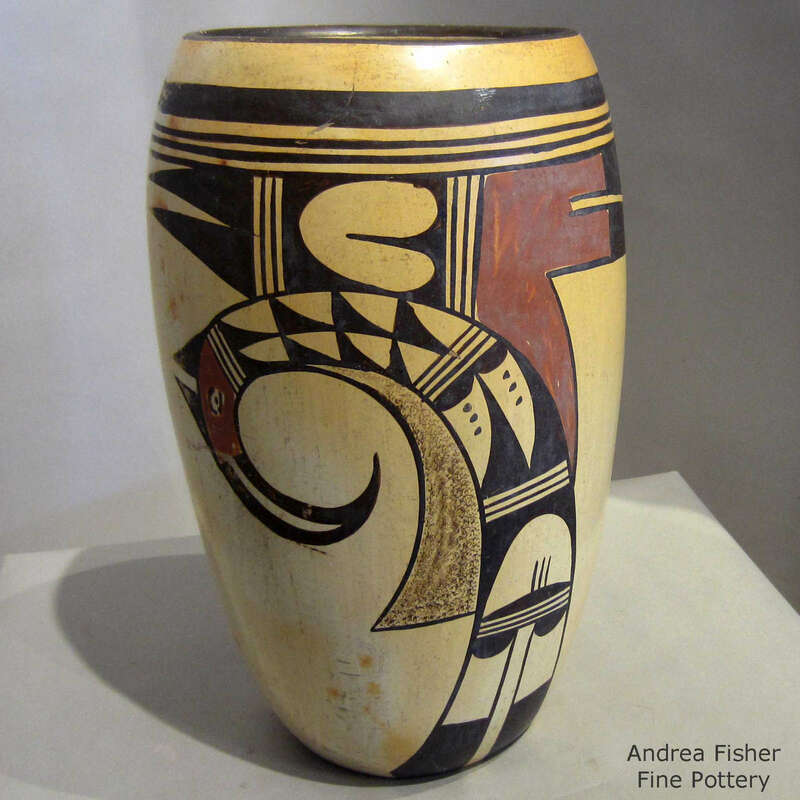 There were always women who made pottery for the sheer joy of making pottery but now there was something new to get excited about. 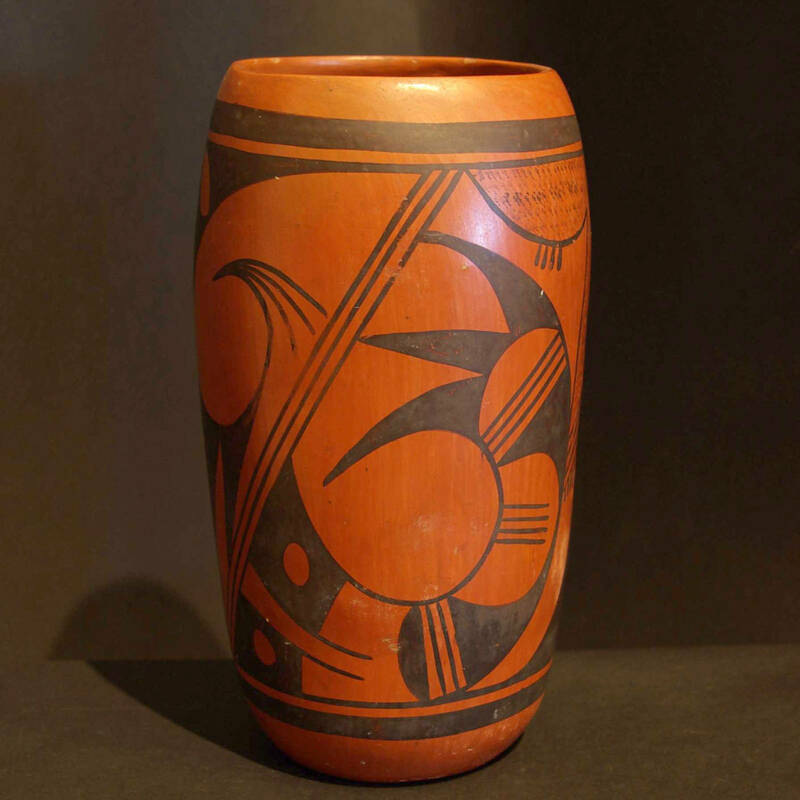 When Nampeyo (1858-1942) began producing pottery modeled in shape, color and decoration after pot shards she found among the ruins of Sikyatki, the Hopi revival really took off. Nampeyo lived in the Tewa village of Hano and her imagination was fired by the discovery of ancient pot shards in Sikyatki, a village inhabited between 1375 and 1625. The Sikyatki style required the use of a fine-textured yellow clay rather than the heavier yellowish-white slip the Hopi had adopted from the Zuni. 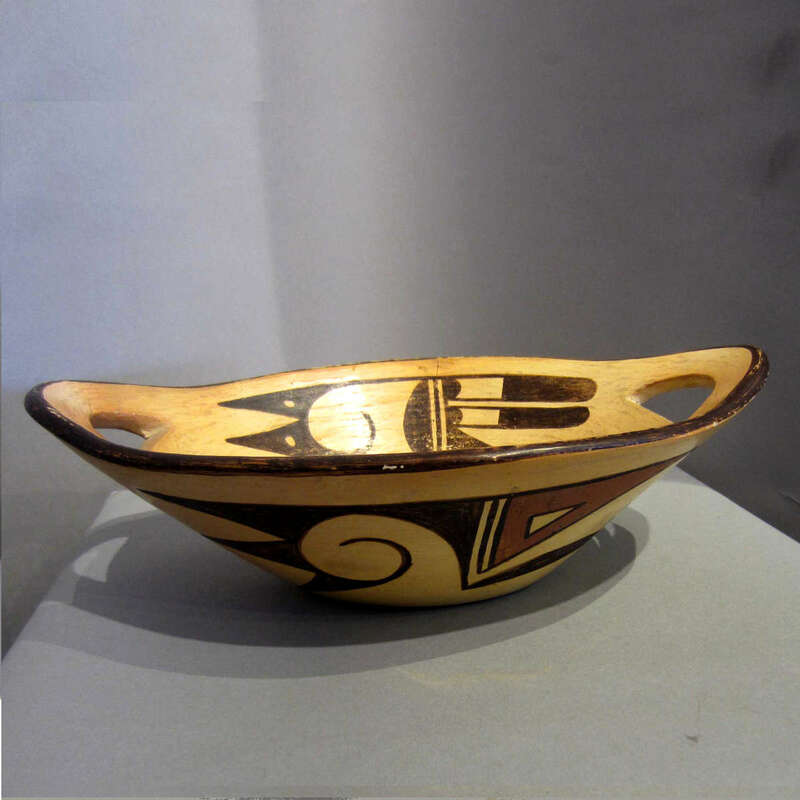 That finer clay allowed Nampeyo to develop an unslipped yellow body with a high polish. She also decorated her pottery with prehistoric stylized images of butterflies, birds and other designs, ushering in a whole new era of Hopi pottery making. The dynasty of pottery artists that began with her is still dominant among Hopi potters.